"Sampath Speaking" - the thoughts of an Insurer from Thiruvallikkeni: India wins silver at Champions trophy .... but, why were results delayed !!! India wins silver at Champions trophy .... but, why were results delayed !!! Yesterday a match between Mohan Bagan and Bhowanipore was live on TV – and watched too - it was CAB Super League final - played on an excessively green pitch and the square around it was also lush. It was significant for it was the first pink ball match in India and in order to maintain the visibility of the pink ball, the odds have been stacked in favour of seamers as things stand now. The shorter the contest, the tighter the contest. Away at Harare, Zimbabwe, outclassed in all three ODIs, pulled off their second successive 20-over win over India, shading a match of exceedingly tiny margins by two runs to go 1-0 up in the T20I series. It came down to MS Dhoni and what he could do with the last ball, as it has so many times in his career. India needed four, and Neville Madziva bowled a wide slower ball. Dhoni, jumping across to reach it, slapped it wide of deep point, but could not generate enough power to beat the fielder. He simply moved a few yards to his right and kept India's captain to a single; yes, India could not score 8 off the last over ! Moving away from Cricket, the Netherlands were the only team to record a victory on the opening day of the Women’s Hockey Champions Trophy 2016, with team captain Maartje Paumen proving herself to be the star of the show with four goals as her team claimed a 6-2 win over New Zealand at the Lee Valley Hockey Hockey & Tennis Centre in London. For those following, the 36th edition of Champions Trophy for men just concluded. Australia defeated India to win their 14th title after a penalty shoot-out. After the match, there was no medal ceremony – as the FIH took a lot of time to announce the results. Champions Trophy is an international field hockey tournament held by the International Hockey Federation. Founded in 1978 by Pakistan's Air Marshal Nur Khan and the Pakistan Hockey Federation, it features the world's top-ranked field hockey teams competing in a round robin format. 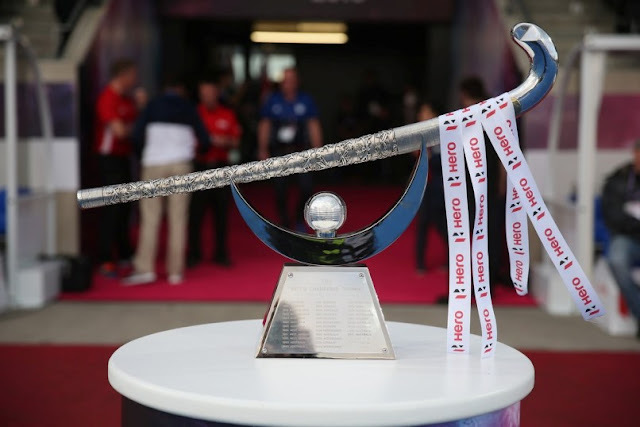 Champions Trophy was changed from an annual to a biennial event from 2014 onwards, due to the introduction of the Hockey World League. The 2018 edition will be the last edition of champions trophy. Australians have won the trophy fourteen, the Germans ten, and the Dutch eight times. India played their first ever Champions Trophy final against Australia in London. After being goalless in regular time, India lost 1-3 in the shoot out – it was not decided on field though. At the Lee Valley Hockey and Tennis Centre in London, goalkeeper Tyler Lovell was the hero of the hour, conceding just once in the shoot-out to help the World champions to glory. A pulsating game finished with the score locked at 0-0, although it had been packed full of drama. Australia’s Blake Govers missed a penalty stroke, while India were dominant in the third and fourth quarter before losing the shoot-out. Following an official protest from India against a situation which occurred in the shoot-out, there was a delay in the official confirmation of the result. The protest - in relation to an unintentional foul that had lead to the shoot-out being retaken - was rejected by the Technical Delegate. Earlier in the day, Germany edged past Great Britain to win the bronze medal thanks to a solitary strike from tournament top scorer Marco Miltkau. India lodged an official complaint to the FIH tournament director against the second shot taken by Australia, saying the obstruction by India goalkeeper Sreejesh was after the hooter. Australia’s player hit the ball into Sreejesh pads and it was not visible for a split second. Both players looked at the umpire who didn’t stop and said, “Nothing, nothing. It’s clear.” Australia player played on and the hooter went off. But, both players kept playing and Sreejesh cleared the ball. Australia asked for a review and the TV umpire gave a decision that the shot had to be re-taken. “I see an unintentional obstruction by India goalkeeper and the shot has to be re-taken,” third umpire said on air. Australia scored on the retake. India coach, Roleant Oltmans was furious with the decision and decided to lodge a complain. Australia won the shoot out 3-1 but the official result was not declared by FIH. The tournament jury seemed to be in a fix when India filed an appeal against the video umpire’s decision to re-take the second attempt in the shootout. It took the jury multiple replays to find a way out of the embarrassing situation that kept the result pending. After an hour and a half of the match, the jury eventually discovered that the ball had rolled under Indian goalkeeper’s pad for a couple of seconds. The jury later cited this as the cause why the shootout was re-taken. But it still took the jury a lot of explanation to the Indian captain and coach before announcing that the result would stay. Australia thus won the title, but both teams had to be ushered out of the ground, to send a signal for the crowd to go home. The medal presentation was then staged in the media interview room, away from the spotlight. “The umpires have failed,” said Narender Batra, President of Hockey India, who vehemently protested from the VIP galleries. “The shootout attempt went on for over 14 seconds, and then it was re-taken. “Just to cover up their shortcomings, they are now pointing out at a different incident,” he said. “If the goalkeeper had made an infringement, then a penalty stroke should have been awarded,” Batra emphasised. It was an unusual end to the tournament. Indians gracefully accepted the verdict. Speaking about the events that took place, FIH CEO Kelly Fairweather said: "First and foremost we would like to thank both Australia and India for graciously accepting the outcome of this decision. Their sportsmanship on the pitch was further evident off it during this official process. We would also like to apologise to all of the fans in the stadium and watching on TV around the world. Due to the timescale involved they were not able to witness the Trophy presentation following what was a thrilling Final. As a result we will be looking at ways to minimise such delays in the future."